How to connect data sources? Data is the foundation of every single one of your dashboards. In order to import this information into our system, you first need to connect your data sources. Integration: An integration is a software, a platform, or an application that provides you with data. For example, Google AdWords, Facebook Ads, and Ahrefs are some of our integrations. Have a look at our website to see all the integrations we offer! Authorization: An authorization is your account for a particular integration. It generally requires your credentials (email, ID, password, etc. ), in order for DashThis to import the data. For example, our Google AdWords and Google Analytics integrations will ask for your Google Account credentials, Facebook Ads and Facebook Insights will ask for your Facebook Account credentials, and Moz will ask for your Moz Access ID. Data source: The data source is the tiniest piece of information we’re able to access once you’ve connected an integration to DashThis. The data source allows us to get those big numbers to show in your widgets. You can connect multiple data sources in the same dashboard; however, depending on the integration you use, data sources will have different names, such as “accounts”, “views”, “pages”, or “websites”. To help you find your way around, here’s a list of all our integrations and the term used to describe their data sources. It’s now time to import your data! 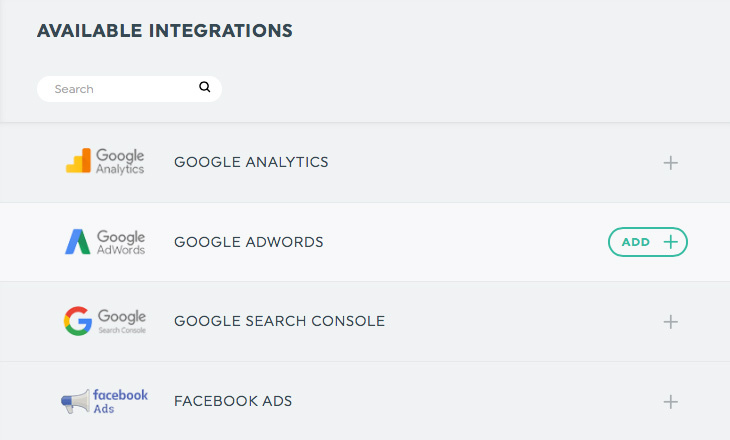 When you’re connected to your DashThis account, visit the Integration Manager by clicking Integrations in the left menu. 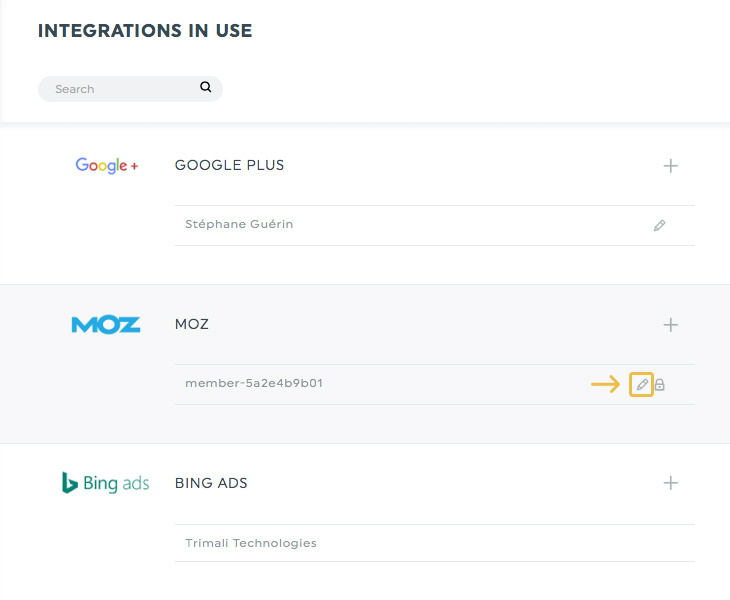 Under the section Available integrations, choose the integration you want to connect and click Add. be redirected to the integration site, where you can connect your account as usual. see a panel on the right side of the screen, where you can enter the required information. For some integrations, such as Google Analytics, Mailchimp, Instagram, and Marchex, the process ends here: the integration automatically adds the data sources related to the account you just connected. For other integrations, however, you need to manually add the data sources. But how do you know if there will be an extra step? In the Integration Manager, find your integration under the section Integrations in use. If there’s a pencil icon next to your account (like for Ahrefs), you need to manually add the data sources you want. If there’s no pencil icon (like for Perfect Audience), the integration will automatically add the data sources. When you click the pencil icon, a panel will appear on the right side of the screen. Enter the required information, and click Add client. Go back to your account, and connect your data sources! Then? Time to create your first dashboard! This entry was posted in Getting started. What is a dashboard? How to connect data sources? How to create a dashboard? How to add a widget? How to share a dashboard? How to use the Viewer mode? How to use the Editor mode? How to use the dashboard manager?